Wet, Dry or Mixed Puppy Food? What food is best? How much and how often? 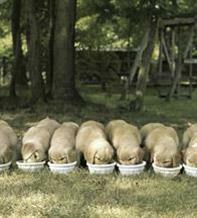 Puppies need a consistent feeding routine. You can ensure their mealtimes are problem-free with these tips. Small puppies: 4 to 5 small meals a day until they’re 10 weeks old. From 10 weeks to 5 months: 3 meals a day. After the 5th or 6th month: 2 meals a day. Your puppy’s internal tummy clock will start their digestive juices going at their usual dinnertime, whether you’ve put out their food or not. Unless you stick to a routine they won’t be hungry when you put their food out. And waiting too long could give your puppy tummy problems. Choose heavy-bottomed ceramic or stainless steel food and water bowls. Plastic bowls will probably end up as chew toys, and the tooth marks could become a haven for bacteria and cause damage to the teeth and gums. A heavy bowl will also be harder for your puppy (and you) to knock over by accident. Make sure your puppy’s not disturbed while eating or they’ll get used to eating in fits and starts, or begin spreading their food around the house. Give them up to 30 minutes to eat their meal. After that, take away any uneaten food and serve fresh food at the next meal. Fresh water must be available all the time. After eating, your puppy may need some peace and quiet or a nap to help them digest their food properly. So plan exercise for before, not after, their mealtime!